Carte de visite (CDV) photo measuring 2.5 x 4 inches. Photographer is J. A. Tice of Janesville, Wisconsin. Otherwise undated and unidentified. I am always struck by the way her face isn’t showing any particular expression, and yet manages to look very intense. I’m also struck by the rather large expanse of wall above her head. It feels almost contemporary in its framing, the indulgence of so much seemingly unused image space, and I assume that the photographer is dealing with cumbersome equipment and can find no way to avoid this unless she stands. Except that the wall space could be said to mirror the large expanse of fabric below her waist, and both parts could be said to evenly frame her face and torso. I wonder if such artfulness could be deliberate, and then I chide myself for the prejudice of assuming that photographers of that era were primarily mechanical in their work. I always err on the side of crediting the artist. Especially in photography, there’s always an element of the accidental in every composition. In Europe, there was a great dialogue between painters and early photographers; many painters took up photography to make studies, and photographers often created compositions in the darkroom by manipulating their negatives. So I think it’s reasonable to assume that this photographer was aware of the statement made by that large, blank wall balancing the skirt. But the facial expression is probably a bit more “accidental,” since the slower exposure times required models to hold still for several seconds while the shutter was open. And maybe Americans hadn’t acquired their mania for looking ecstatically happy all the time. I think Hollywood sold us on the idea that we should go around grinning every minute of the day. “I always err on the side of crediting the artist.” Good policy! I do know that early photographers were perfectly artistic in their ambitions. Many of their studios included words like “artistic” in their names, seeming to make a point in their advertising that they are on par with painters. So I don’t know where my prejudice comes from, but somehow my mind works that way until I consciously correct it. (Kind of like the way I assume cats are female and dogs are male, even though intellectually I know that’s preposterous.) In fact, it’s useful to look at truly unskilled photographers to remind myself of this. 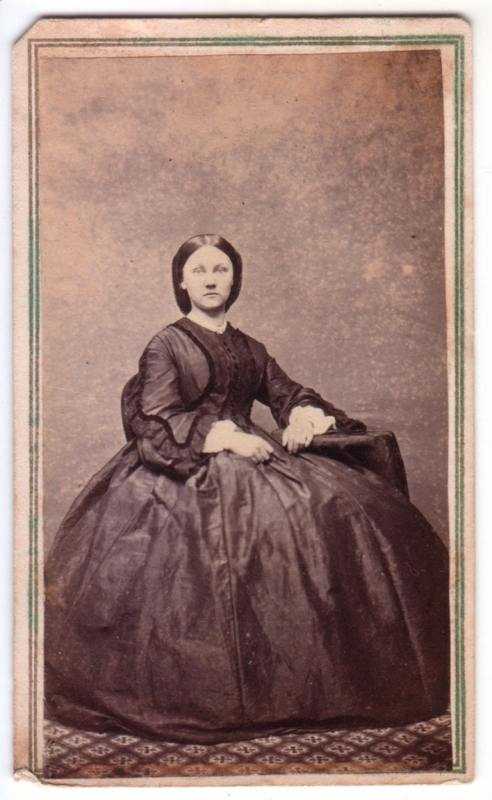 I guess part of what fools me in the case of this CDV is the fact that it’s so small in real life (I’ve blown it up considerably for this post), so I can’t help but question the choice to frame it in such a way that her face is nearly indistinguishable without magnification. Regarding the facial expression, yes, the exposure times for photos of that era could be up to a full minute, depending on the available light, so people had to have expressions they could maintain easily, and why pictures of inherently fidgety things like children and pets are less common. I’m just impressed by the way her face, even in apparently repose, can look so expressive. This CDV shows a gorgeous example of Civil War dress, with the dropped shoulder, pagoda oversleeve with white undersleeve and cuff, and the very simple yet luxuriant trim of dark velvet ribbon with ruffles on the bodice. Her hair is neatly parted and netted in back. This would probably have been about 1862-64; she wears no jewelry, watch chains, necklaces or earrings that I perceive. Holding a pose for a photo then is a challenge; but I also do think that the early photographers were probably more ‘artistic’ than we often credit. No doubt they felt the gravity of recording their subjects images. And these days, we may look ‘happy’ in our photos, but do we really look intense? In case you have not gotten to it yet, Matt, the September 26th “New Yorker” has an interesting article (Depth of Field) about the extensive effort Thomas Struth went through to get an “artistic” Diamond Jubilee picture of Queen Elizabeth and the Duke of Edinburgh. I found it fascinating. Hmm, it doesn’t ring a bell, so either I haven’t gotten around to reading it (but I usually at least page through them when they arrive), or else my Post Office hasn’t finished reading it, or whatever causes their delays. It sounds fascinating, and I’m looking forward to it. Thanks for the heads-up! I dug around my apartment and found the article. I do remember seeing it when it first arrived. It’s funny, but even though you explicitly mentioned Queen Elizabeth, your reference to the Diamond Jubilee in the context of my antique photos somehow translated in my mind to Queen Victoria. I think that’s partly why I didn’t remember the article at first. I read it this evening, and yes, it is fascinating. I was unfamiliar with Struth’s work, though I’ve seen the work of some of the other German photographers who work in that huge scale, particularly Andreas Gursky. And I’ve seen exhibitions of the work of his teachers, Gerhard Richter and the Bechers. It’s interesting to hear them all discussed in context. And the portrait of the queen is lovely. Thanks for alerting me to the article! I have a J. A. Tice photo from the same period of my great, great aunts Polly and Loretta Earl if you’re interested in seeing it. Hi, Jim. Sure, always happy to see other vintage photos, and it’s interesting to compare different works by the same photographer.